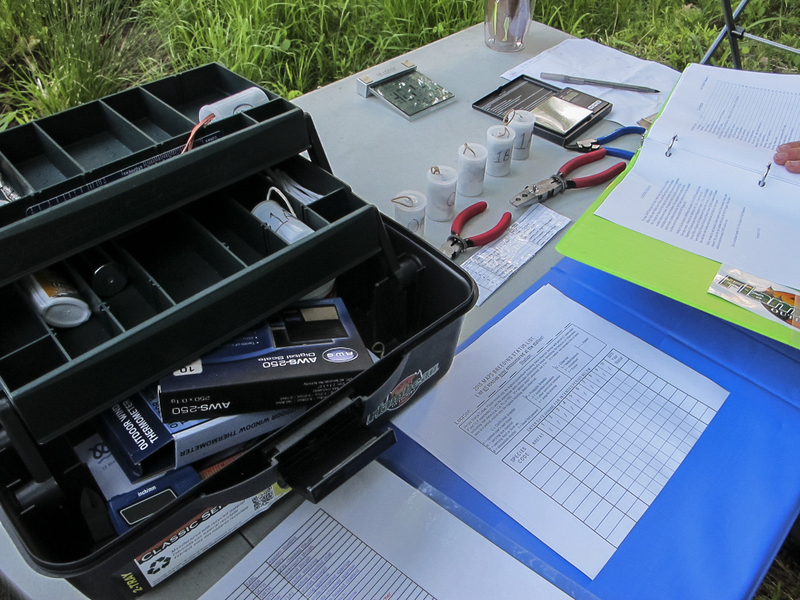 Last Friday was the first day of operation for WVWA’s MAPS station. I was so excited (and afraid my alarm wouldn’t go off…) that I’m pretty sure I didn’t even sleep! Hooray coffee! When we got to the preserve in the wee morning hours, the birds were already singing and on the move. The nets were opened at sunrise, and it wasn’t long before they started producing. 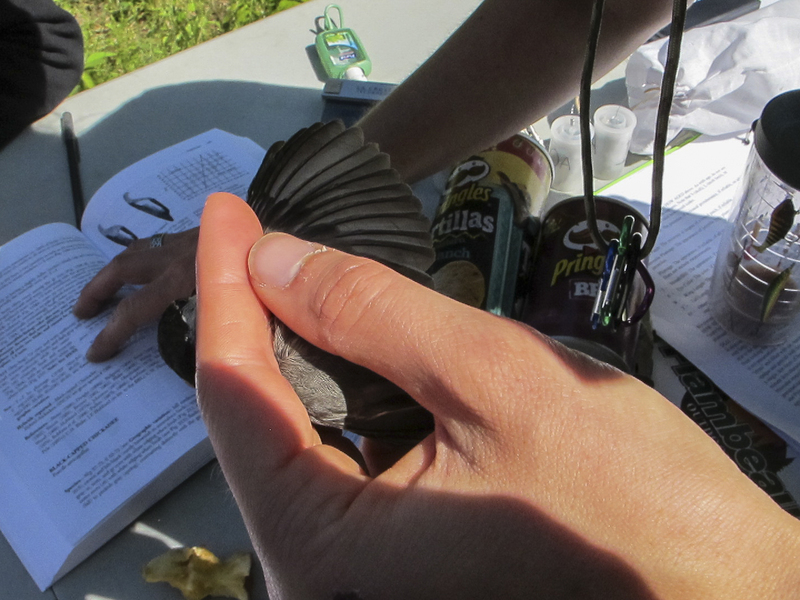 We banded for 6 hours, ending up with a total of 27 birds across 10 species. Aaaand Catbirds for the win. I was happy to see so many – they are one of the most straight-forward species to age. All set up and ready for the first wave of birds. 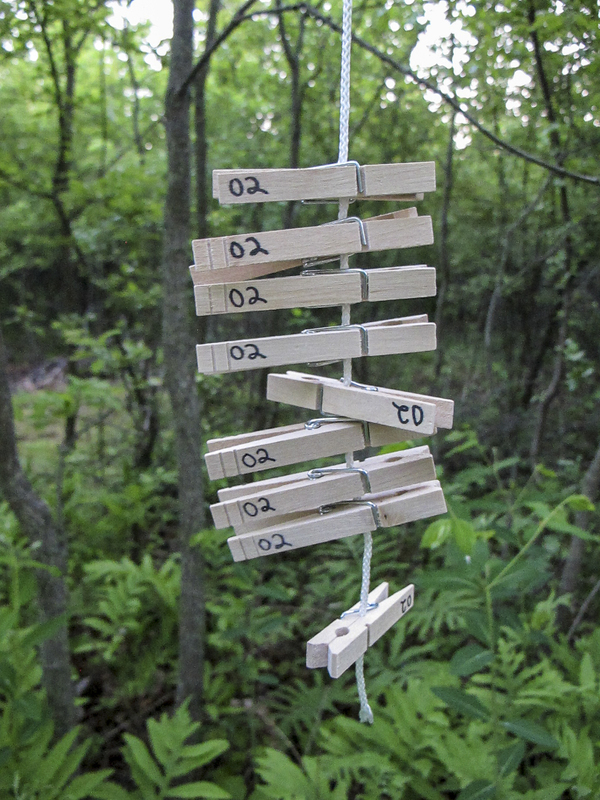 The bands themselves are kept on string or wire, and stored in film canisters so that they can be taken out from a slit in the top one at a time, and stay in numerical order. They range in size from 0A (smallest) to 4 (largest). 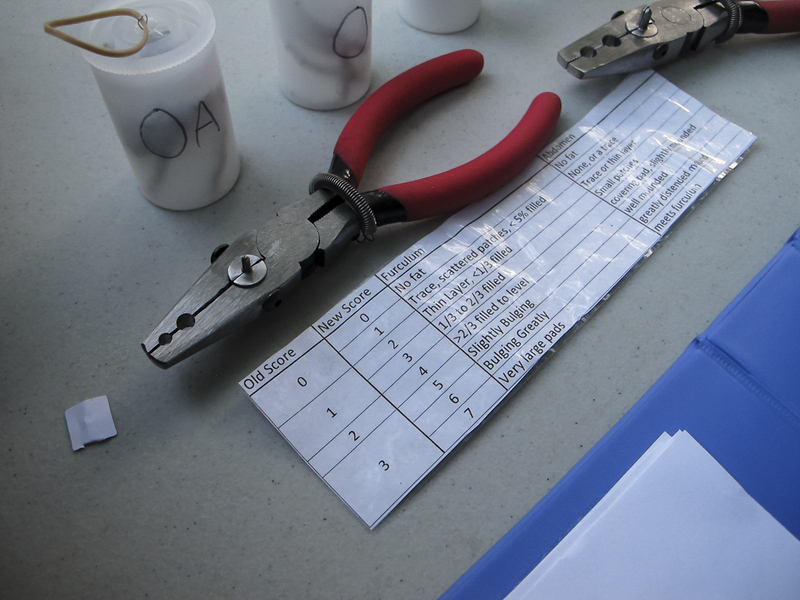 Two sizes of pliers are used – one for bands size 0A-1A, and one for bands size 2 and bigger. Each bird also gets a score of the amount of fat it has stored in different parts of the body – this cheat sheet comes in handy. Checkin’ nets and takin’ names. Birds can’t see the fine, nylon mesh of a mist net. Like the unsuspecting Song Sparrow pictured here, they fly right into it and drop into its pocket, where they wait patiently (some moreso than others…) to be extracted. 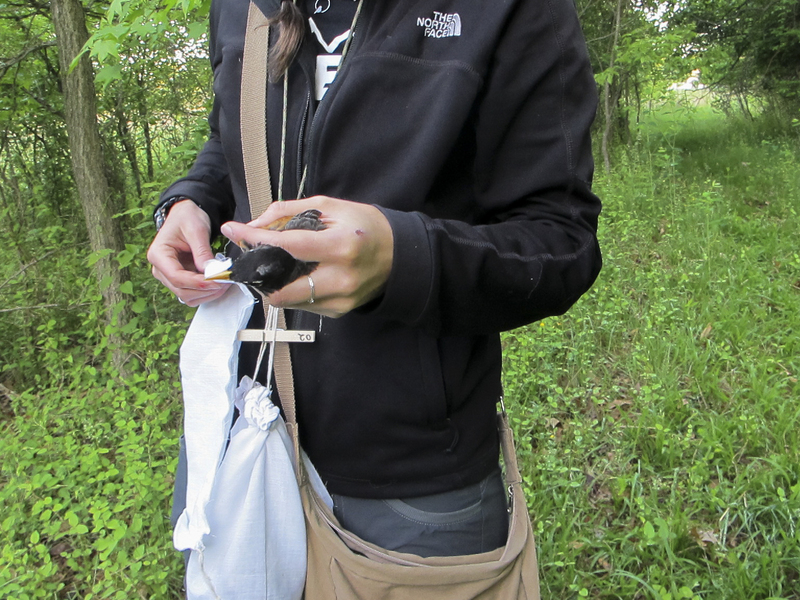 Putting an American Robin into its holding bag, where it will relax and hang out (literally) until being banded back at the station. 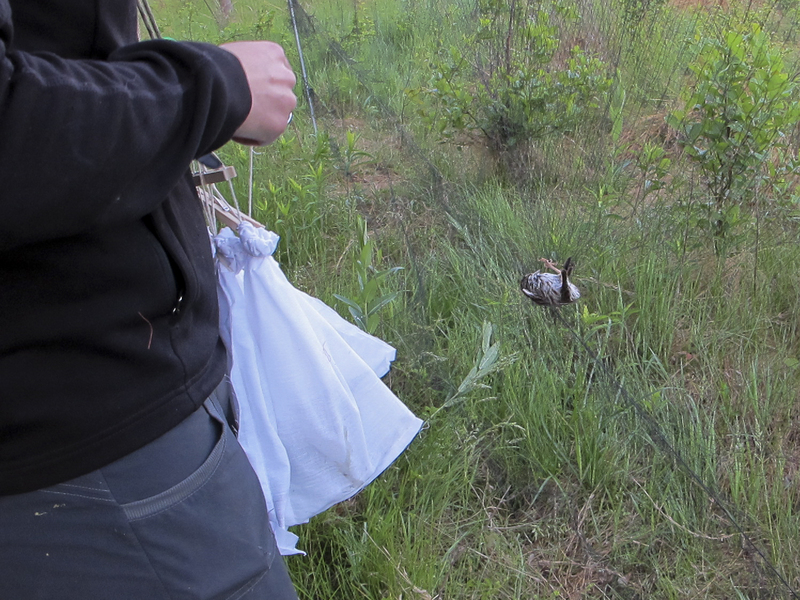 Nets are numbered from 01-08, and after a bird is extracted, a labeled close pin (or “net clip”) is attached to its bag so we know where each bird was caught. Birds are momentarily hung on a drying rack at the station, prior to being banded and processed. 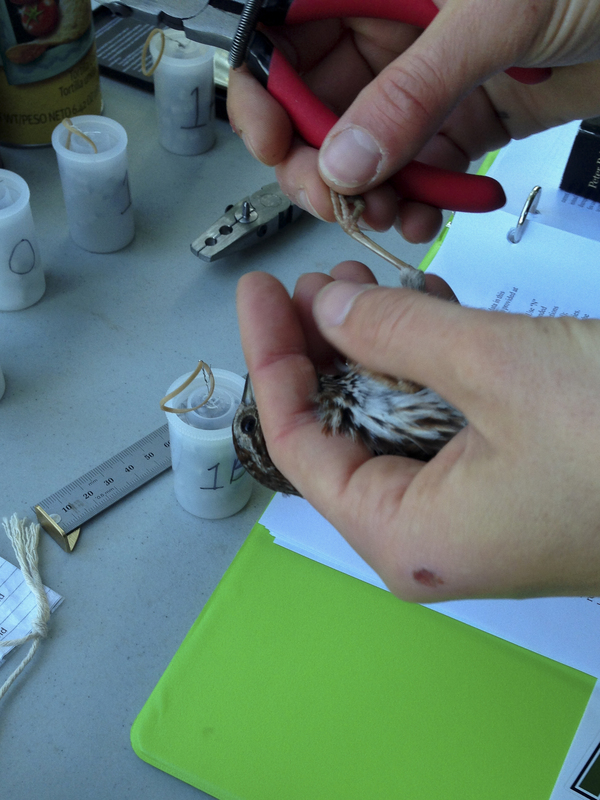 Song Sparrow, T-2.5 seconds to banding. 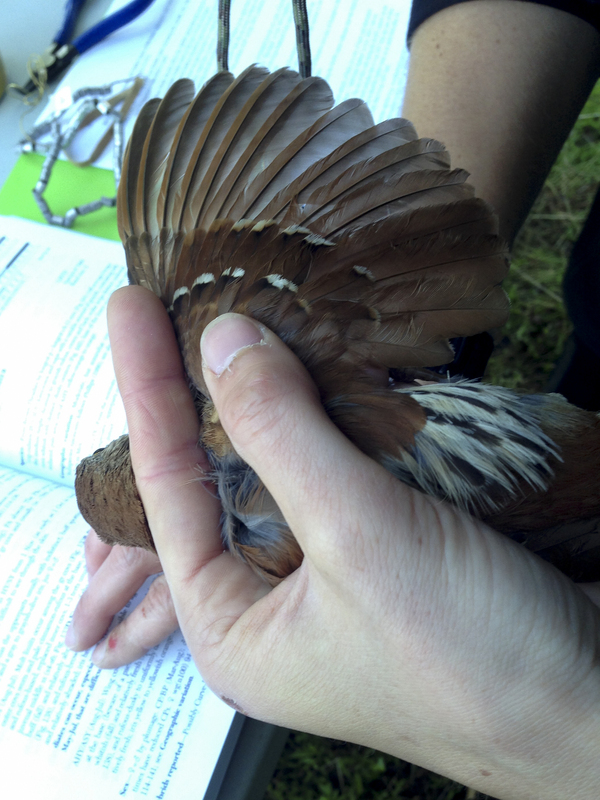 I think the Brown Thrasher, too, was trying to understand herself by looking at Pyle. Molt – PB: HY partial (Jul-Sep), AHY complete (Jul-Aug); PA absent. The PBs occur on the summer ground. the 1st PB includes 2-9 inner gr covs and usually (in ~78% of birds) 1-3 terts, but no rects. AHY/ASY (Aug-Jul): Wing covs and terts uniformly adult, the gr covs deep rufous at the base (beware of a psuedolimit among the outer covs); the terts tipped whitish (fall) and relatively fresh (spring); outer ppcovs broad, truncate, relatively fresh, and rufous-dusky to uniformly deep rufous; outer rects truncate and relatively fresh; iris yellow to yellowish orange. So after translation into coherent English, all of that indicated that it was an ASY bird. 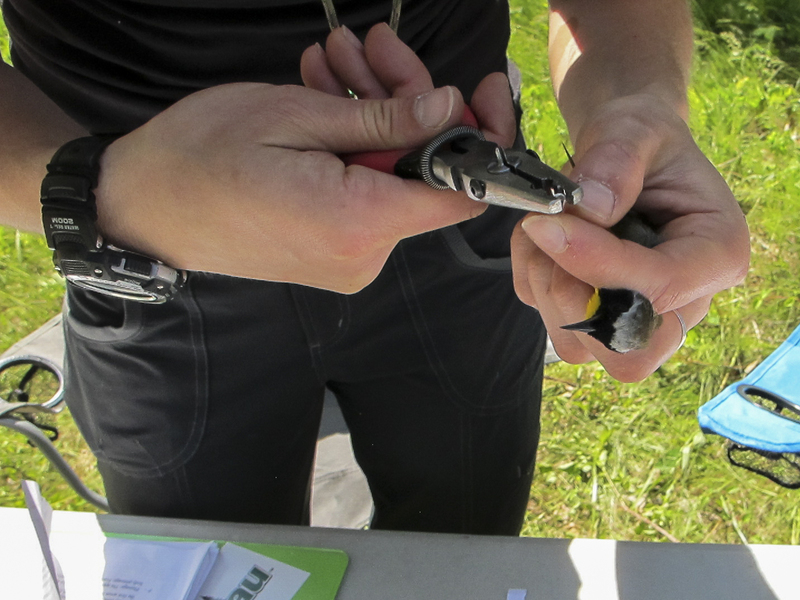 Banding a Robin, one of several for the day. 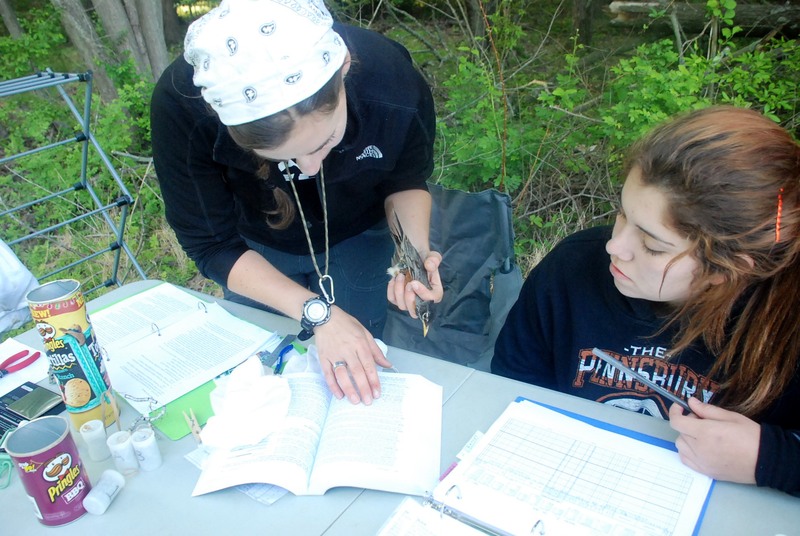 Processing another Robin while volunteer Marcela Perez (right), an exchange student from Costa Rica who has been interning with WVWA, looks on and records data. 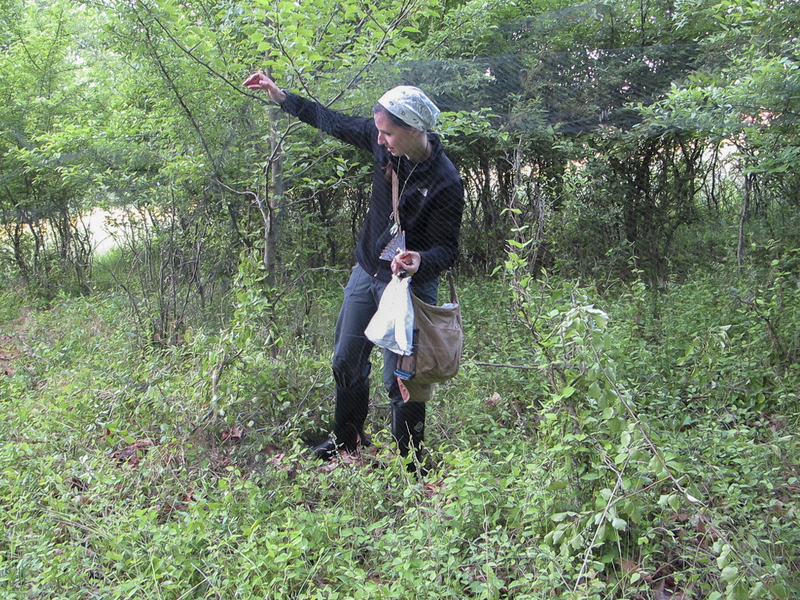 Opening a band for a Common Yellowthroat. They are one of 53 species of Wood Warblers (Parulidae), whose family characteristics are delicate features, small size, and slender bills. Males have a black mask, while females do not – that is why 89% of bank robberies committed by this species are committed by males. At first you might notice a Gray Catbird in this photo. But then your eyes will undoubtedly wander to the pringles cans in the background. Don’t worry, I don’t handle birds with chip-hands. The birds are actually gently placed in those empty cans and weighed on a small digital scale. What can I say, banders use some pretty fancy equipment. Even though it got a bit windy toward the end of the day (always fun when data sheets are scattered far and wide… ha), we were able to stay open until closing time. 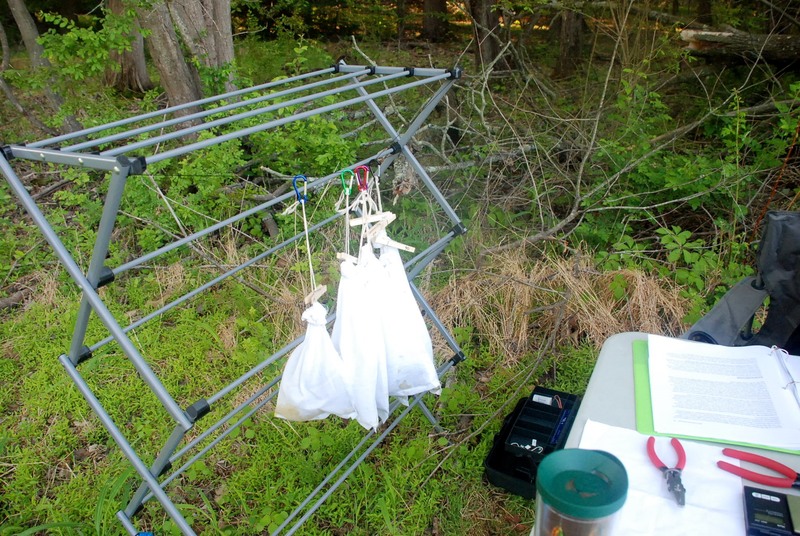 As far as first days at new banding stations go, it went pretty fantastic. 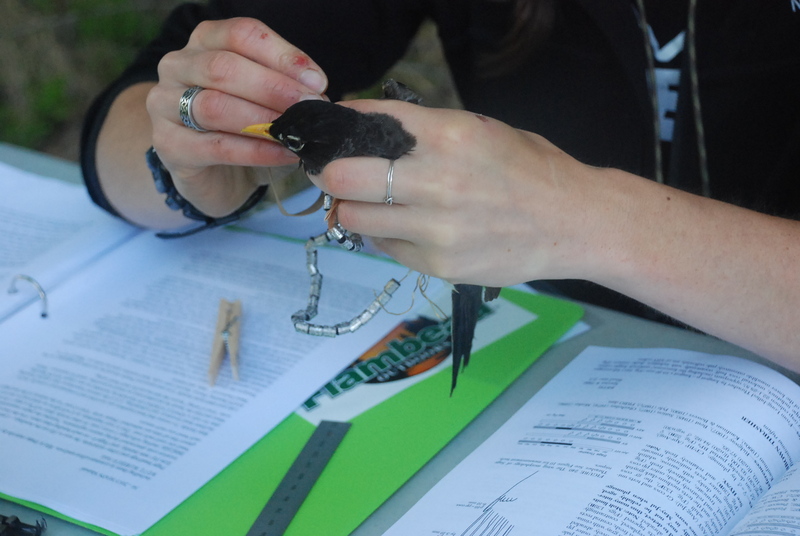 We’ll be out banding again soon, so stay tuned for another post sometime next week. Fascinating, informative and very exciting. And you have a great sense of humor, too!! !